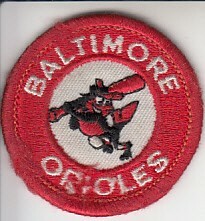 Baltimore Orioles 1980s embroidered logo patch, 2 inches in diameter. Has minor wear. Back has black fabric residue as it was previously attached to apparel. ONLY ONE AVAILABLE FOR SALE.